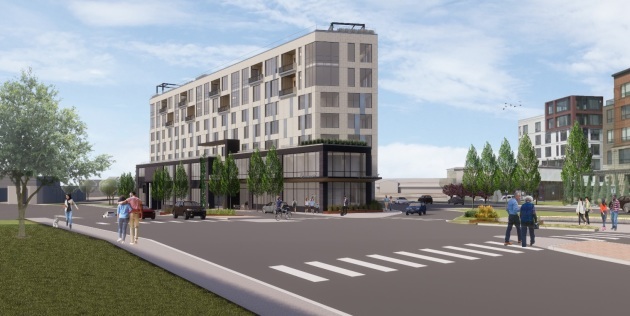 A new 8-story boutique hotel and condo complex has been proposed to be built on the northwest side of Bde Maka Ska (Lake Calhoun) in south Minneapolis. The West Lake Street Hotel and Condos would take the place of the existing BP gas station on a triangular-shaped parcel at the intersection of West Lake Street and Excelsior Boulevard. The complex would have 100 hotel rooms, 20 condos and a restaurant. Blaine-based Elevage Development Group is scheduled to discuss its plans Thursday at the city planning commission’s committee of the whole meeting. The West Lake Street Hotel would also have parking for 107 vehicles with one level of underground parking and another of aboveground space. The building, which was designed by ESG Architects, would also feature a rooftop deck with a pool to serve both hotel guests and residents. “Adding hotel and residential uses at this location naturally creates a more inviting streetscape, as more people will be walking and biking to and from the site which creates an energetic, safe and people-friendly hub, improving the site’s existing condition,” the development team said, in a report submitted to the city.